Finnish television YLE TV2 arranged on the 29th of March 2011 "Netti-ilta" ("Internet Evening"). 18 people were invited. This evening was sort of Twitter breakthrough in Finland. About 3000 Twitter messages called "tweets", which could be found in Twitter using hashtag #a2ilta , were sent from Finnish Twitter users. The conversation was mostly about Facebook, forgetting orher Social Medias, but it was amazing how Twitter users commented the program so well, that you could turn off TV and follow the show from Twitter. 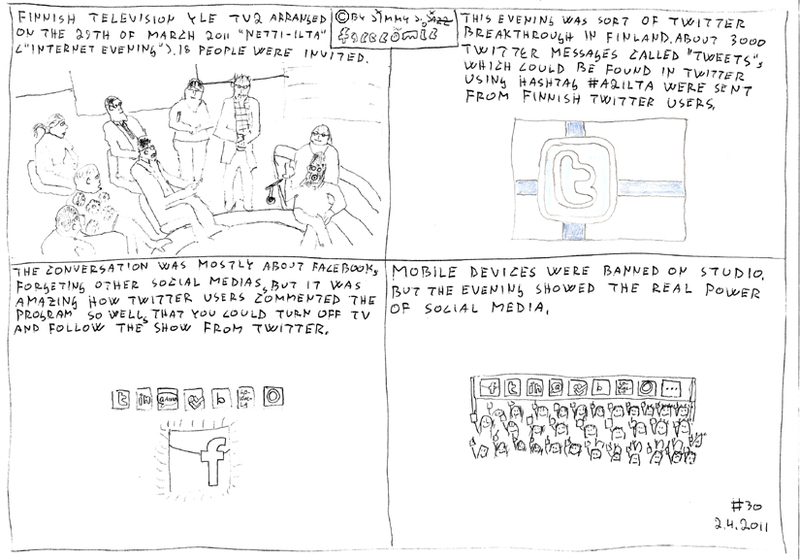 Mobile devices were banned on studio, but the evening showed the real power of Social Media.